Wednesday begins a new month of free public viewing nights on Mondays and Wednesdays at 9 p.m. at the William D. McDowell Observatory. And now for something completely different: This is our first Tuesday Teaser featuring the back of a bird's head. Somehow, we think you'll be able to figure it out. For the hard-of-thinking, here is a profile view. 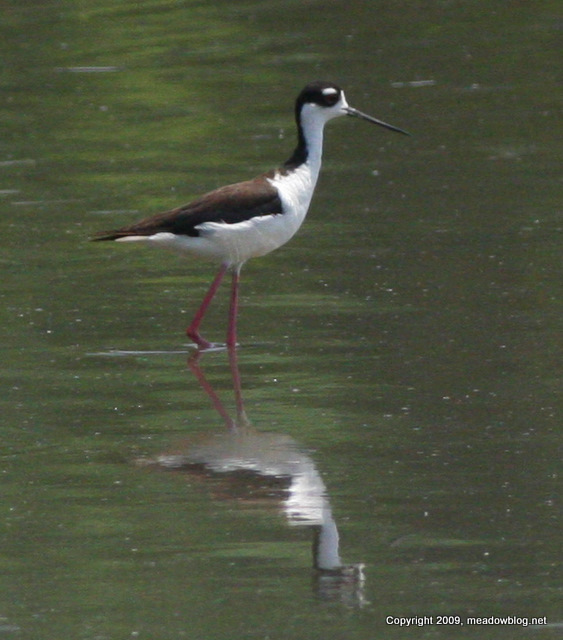 Click here for more on this alleged mystery bird. Tuesday, June 30: Don Torino reports that "I was out doing a Late day heron Survey at Skeetkill Creek Marsh in Ridgefield on Sunday night, ands around 7:30 I had two beautiful Black Skimmers working the Marsh, it seemed in unison. Skimming the water flying just a few feet apart. Pretty cool!" on the left. Photo is from today. Continuing: Four Forster's Terns on the railing heading out to the Vistor's Center in the Meadowlands Environment Center in DeKorte Park. Click "Continue reading…" for other June reports. Jim O'Neill, the environmental writer for The Record, had a neat story over the weekend about the growing presence of Peregrine Falcons on bridges along the Hackensack River as far north as Little Ferry. The story, picked up by The Associated Press, Star Ledger and Philadelphia Inquirer, was also mentioned on NPR. Link is here. Recently, we took the photo above of a Peregrine Falcon youngster (right) ready to fledge under the Route 3 bridge. We believe this is the first successful fledging of a Peregrine Falcon in the Meadowlands north of Jersey City. New Improved DeKorte Guide is Here! DeKorte Park in Lyndhurst has it all: 3.5 miles of trails, great birding year-round, an environmental center, an observatory and a state-of-the-art science center. And now it has a new pamphlet with trail map to make this 110-acre park more accessible and enjoyable. To pick up your copy, just stop by the front desk at the Meadowlands Environment Center. New features include: Mileage for each major trail segment, so you can calculate how far you've walked. More-detailed names for the various tidal impoundments, so you locate rare birds more easily. 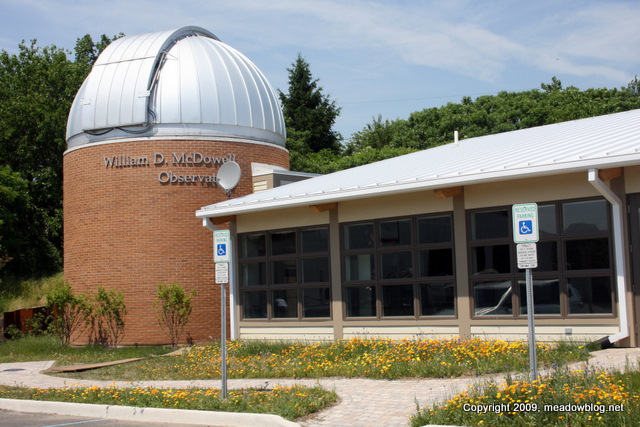 The pamphlet has also been updated to include information on the William D. McDowell Observatory and the Center for Environmental and Scientic Education. 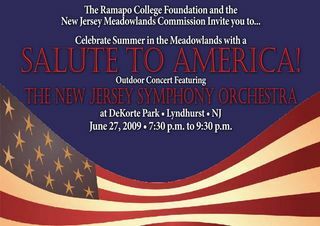 A reminder: The New Jersey Symphony Orchestra (NJSO) will perform a “Salute to America!” – a selection of patriotic tunes, American popular music and opera favorites – this Saturday (June 27) in DeKorte Park at 7:30 p.m.
DeKorte Park will be closed from noon to 5 p.m.on Saturday, at which time only ticket-holders will be admitted. Click "Continue reading …" for details. 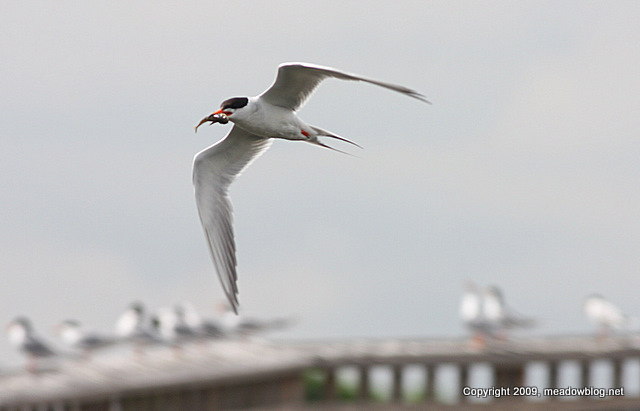 Forster's Terns have been putting on an amazing display at DeKorte Park, on the elevated boardwalk next to the Meadowlands Environment Center. At least 20 terns sit on the railing of the walkway, often in one long row, as though it were a single's bar on a Friday night. The males fly off, catch a fish, then return and give it the object of their affections. The female takes the fish, though not before much ado and squawking. 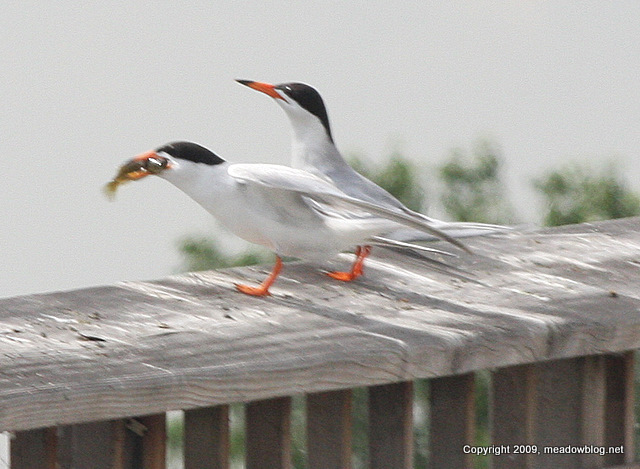 If you are at DeKorte near the Visitor Center, you will likely hear the terns before you see them. Click "Continue reading …" for a gallery of courtship photos, plus a bright-blue-billed Ruddy and an Osprey with a fish — all while the terns were jabbering away. The New Jersey Meadowlands Commission today announced a new partnership with the Bergen County Audubon Society to bring more nature walks and programs to the Commission’s expanding schedule. The partnership will offer free 90-minute nature walks on the first Sunday and third Tuesday of each month. The programs kick off with a bird walk at DeKorte Park in Lyndhurst at 9 a.m. on Sunday, July 5. Click "Continue reading…" for more information and an upcoming schedule…. We saw a beautifully patterned Eastern Milk Snake crossing the road in DeKorte Park recently. Alas, he seemed a tad under the weather. Although the snake isn't poisonous, we know some people do not like to see snake photos. So you'll have to click "Continue reading…" to see a close-up of its skin. Click here for more on Milk Snakes.